Halloween is a bigger deal than it used to be in my life now that our little one is actually old enough to realize what it is about and enjoy it. I’ve also realized it does give me a very good reason to sew something for my half-pint and not just myself. In 2015, I didn’t do that much sewing for Halloween, but enough to be proud of and count as projects to share. My outfit wasn’t much, just something I put together at the last minute. 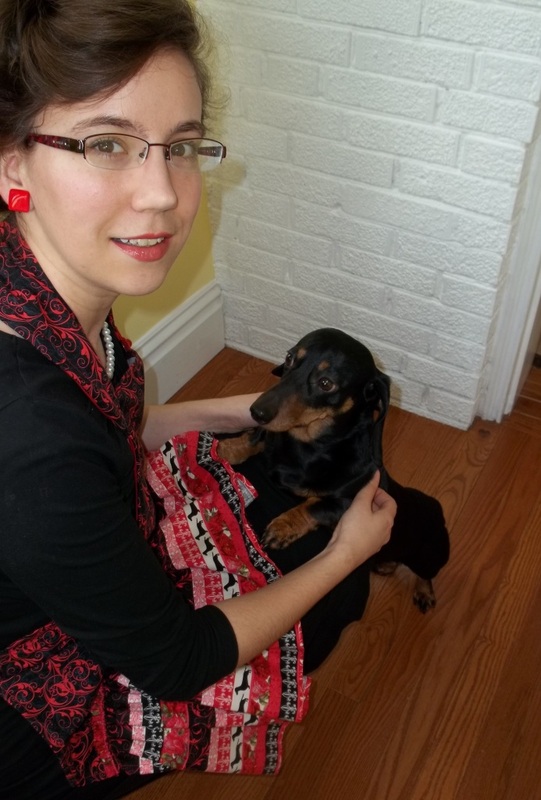 I dressed as some sort of punk, dark, vintage-style housewife, in an original 50’s blouse, a pencil skirt, platform heels, and a handmade apron with dachshund featured print. Yes, that is purple hair I sported for the night. However, my son’s outfit received most of my attention. He went as a 1940’s cowboy, with part vintage, part handmade, and the rest being items from my childhood for a special kind of outfit. FABRIC: For the cowboy: ½ yard of super clearance polyester suede with a metallic printed wrong side; For my apron: a 100% cotton M’Liss print, exclusive to the now-defunct Hancock Fabrics store. NOTIONS: I had all I needed for the cowboy vest and chaps, and for my apron I bought skinny bright orange single fold bias tape. TIME TO COMPLETE: The cowboy outfit parts only took me about 3 hours hours in one evening on October 29, 2015. 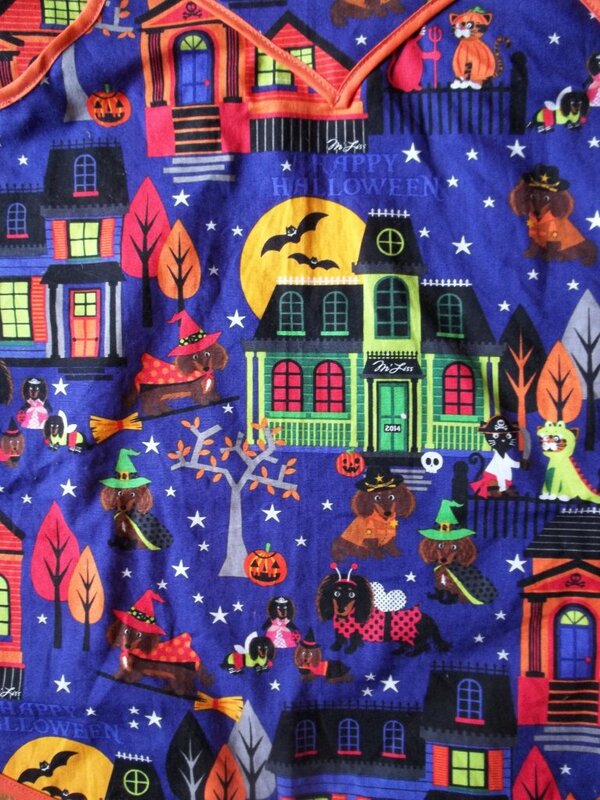 My apron was finished on Halloween, October 31, 2015, made in 3 hours, too. THE INSIDES: The cowboy outfit is a costume so I didn’t do anything fancy inside, my apron is all clean finished bias bound. His hat and six shooter set is mine from when I was his age, the sheriff’s badge on the vest is also mine from a visit to Silver Dollar City. The shirt was given to us by a dear acquaintance – it a true 1940’s original with embroidery of swirls and hobby horses, fancy pockets, and special buttons. For the sewn part, I basically took a simple button front vest from my tykes’ wardrobe and traced it out and remade it into the faux suede. This was easy as pie (which isn’t as easy as some sewing) – just two small side seams and even smaller shoulder seams. Next the vest was cut and re-shaped slightly to be more open and curved so the front so his shirt can be seen. My original plans were to only make him a vest, but my hubby said some passing comment sounding surprised as to the lack matching chaps. I took this as a sort of challenge even though this was not at all what he meant – he just didn’t know what I had in mind. There wasn’t much fabric to start with and even less after the vest was made…but chaps aren’t a full pants leg, anyway. So I pulled out a vintage 1940’s children’s pattern from my stash as the basis to cut by – this way I also was testing out the fit of a pattern I wanted to make anyway. I didn’t have a length of fabric long enough to go all the way up his leg so I merely made a large loop to add on for the top of the chaps’ legs. The loop is perfect for the chaps to hang, or float, over his jeans. A length of elastic is tied around his waist with the chaps’ top loops going through, and the rest hanging from that. A rectangular strip of fabric was sewn all the way up into the side seams, then it was cut into little strips to turn it into fringe. I love how the metallic “wrong side” makes the fringe look quite neat, bestowing just enough ‘bling’ for a little boy’s Halloween outfit. Our little “cowboy” was so tickled by his outfit and so proud of himself. “Mommy made it!” he would tell others on me, but that’s o.k. Being a cowboy must run in the family. My Grandma has a picture of her husband, my Grandpa, in a handmade cowboy outfit when he was little, so I’ve been told. My dad loved playing cowboy himself – his room (when he was my son’s age) had a western theme to it, as I can still see in the cute printed paper lining of his old dresser set. One of my dad’s favorite Christmases growing up was the one when he was given a western set, and he still remembers the bright red velvet hat that came with the set. 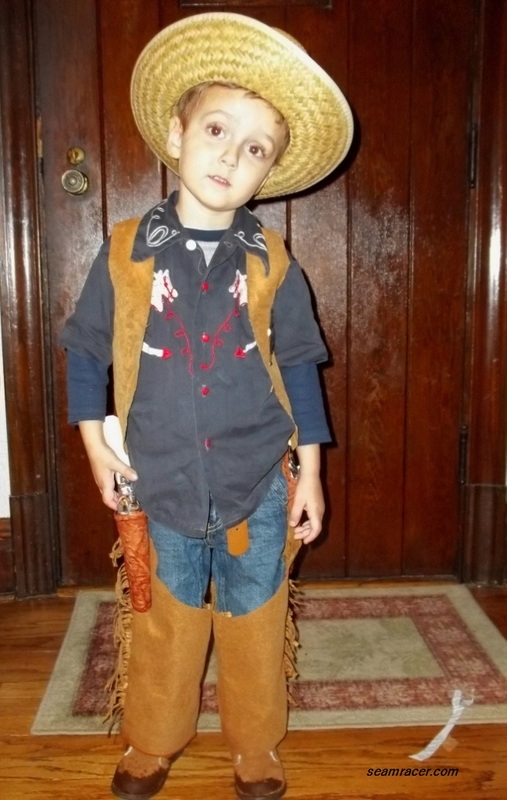 In the old pictures from then my 5 or 6 year old “cowboy” dad looks so much like my son did for Halloween – very cute to see. My apron is something I’ve been wanting to make for a long time. The fabric had been bought a while back (maybe a year or two) and the apron pattern has also been on my radar of things to make ever since I bought the book in year 2011. Now I could combine both into one! Besides, how could I go wrong with something that combines my favorite things – a dachshund dog printed fabric (I own a dachsie, by the way), an apron, and a design named after one of my favorite mixed drinks, the Cosmopolitan. This was super easy to make. I like how the pockets are right over the hips – this way they can’t catch stray food like aprons with center front pockets often do. I like the slightly vintage “café waitress” aura to it, as well, though this is not as strong with my version compared to the original in the book. Look at how cute is that fashion themed fabric on the one in the book! My fabric is pretty darling, nevertheless. I mean there are cute wiener dogs dressed as a ladybug, police officer, witch, princess, and butterfly! This is not the best apron for coverage against spills and messy cooking, but it is mostly decorative anyway. I did slightly change the pattern by both making the inner dip of the U-neckline smaller and having the center back neck closure be Velcro hook-and-look tape rather than a button and button hole. I also had to shorten the neck straps so the waist ties would be where they should be rather than on my hips. I went through just over 2 packs of bias tape to go around and around all the edges. 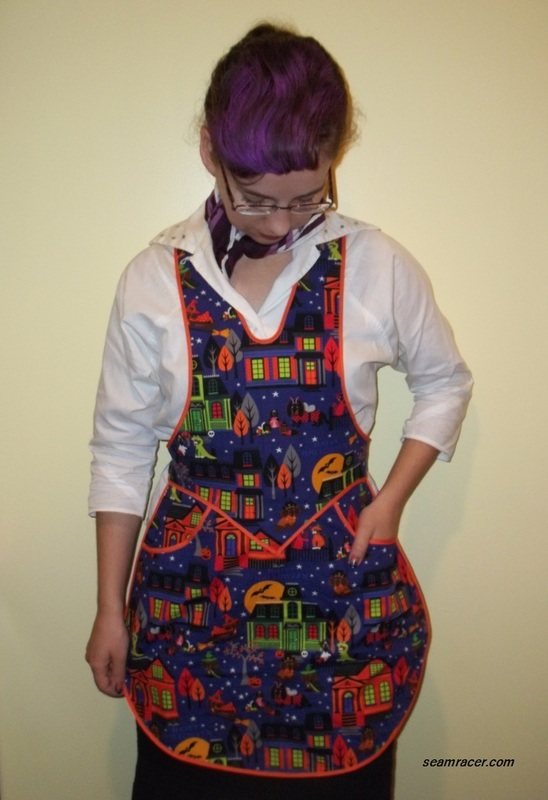 Honestly – that is the hardest and only step that takes up all my time spent to make this apron. I thought the amount of edging I had to sew would never stop. This sounds like a Halloween “Twilight Zone” nightmare… the “different sewing dimension where the edges to finish never stops and keeps going…with no end…you can’t take your foot off of the pedal, and the bias tape keeps coming, never lessening…” Oh, I could have too much fun with this! Happy Halloween everyone! What’s Red and Black and Ruffled All Over? No really, with all its miss-matching of cultures and objects, this apron has a rocking vintage flair, fun prints, and feminine attitude. I can never get enough of aprons, but this newest one tempts me the most to wear it out for more than just cooking or entertaining. Should I wear this one as a fashion statement, what do you think? 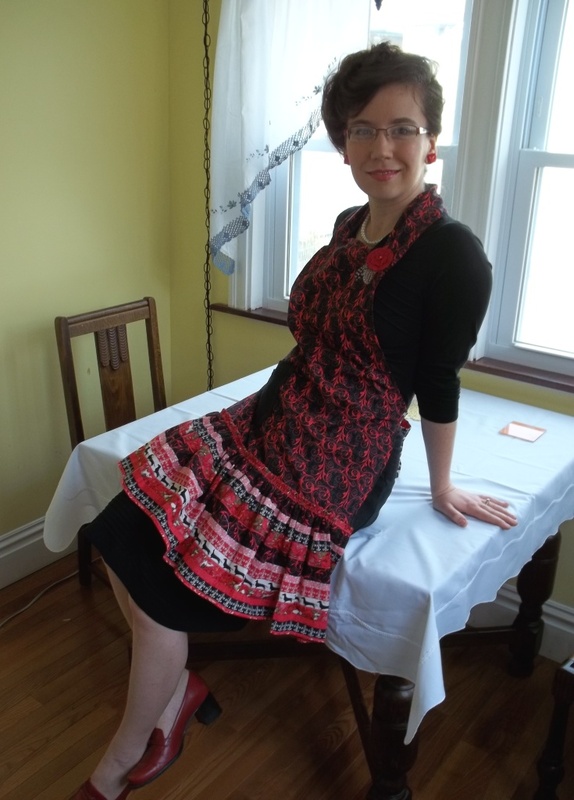 I personally think the apron looks best going overboard in matching and accessorizing in the spirit of fun, like I did in my photos…flowers, feathers, large bright earrings, tight black knit-wear underneath, deep red heels, and a big hairstyle! This wild combination shows the outgoing fearless side of me. Just like for my “Tea for Two” aprons, my “Parisian Dachshund” apron was made into a carbon copy duo: one for me and one for a gift for a family member. I had small doses of both my fabrics and used my high efficiency cutting practices to make two of these highly dramatic frilly versions of a kitchen clothing cover. 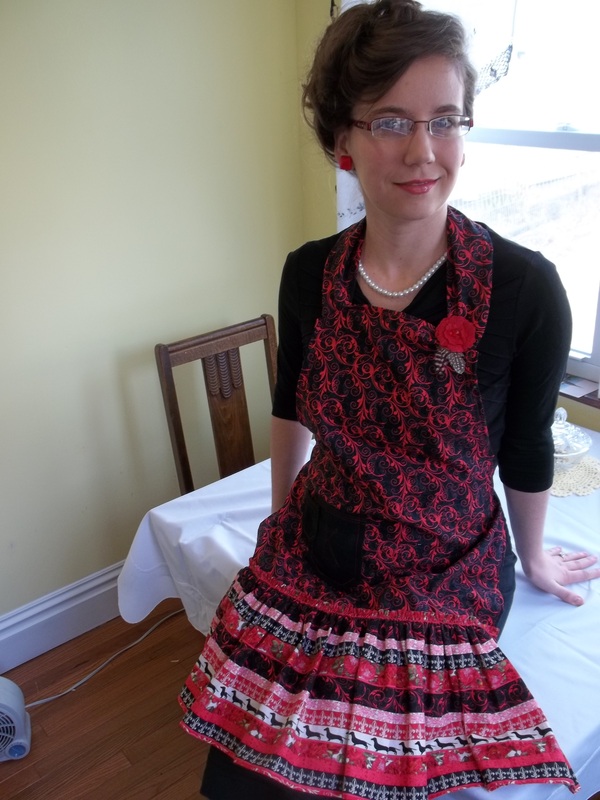 As is normal for me, my best aprons are created when I don’t use a pattern. The starting ‘blank’ for this “Parisian Dachshund” apron was to outline an existing rectangular “cobbler’s” style apron which I own already. Then my supplemental fabric, the one with the layers of Fleur-de-lis, roses, dachshund silhouettes, and scroll work, was cut into long wide strips, to be ruffled. All four of the edges were finished on the strips before I ran two rows of loose straight stitches to gather the top about ¼ inch away from the edge. Cutting out the two apron ‘blanks’ out of only one yard left me with nothing more than a small triangle of scrap fabric left. This small triangle was slightly adapted and cut into more of a crescent shape and made into a neck band for my version of the apron set. I really enjoy the way that this crescent shape fits nicely around my neck. The two skinny ends come to join into the apron top corners, while the flared middle lays over the back of my neck like a collar. For the gift apron, I used two leftover ties of the ruffle fabric to make ties for neckline to make it easier to get around and over the head and face of the recipient. Pockets are a must in my book for an apron! I took a liking to a decent sized scrap of black denim, and used it to make pockets for the aprons. 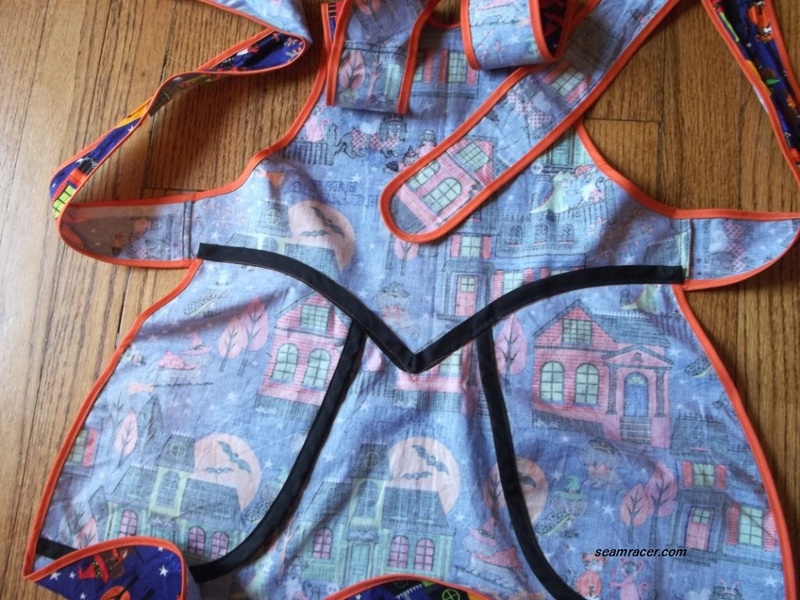 Inspired by the interestingly placed decorative, but useful, pockets on many vintage patterns and garment originals, I added a “mother and daughter” type of pocket style to the “Parisian Dachshund” aprons. There is a normal hand sized pocket, monogrammed for a special touch with the wearer’s initial (a “K” for me, and a “B” for the gift apron) in bright red thread. There is a mini, but still useable (for change maybe), pocket hanging over the edge of the bigger one and slightly a step off and above. Both pockets are top stitched down in two rows of the same bright red contrast thread. I love to add little details and fine work to my projects! This apron is perfectly blended with everything that I love and enjoy: dachshunds, anything French themed, Fleur-de-lis, and aprons. 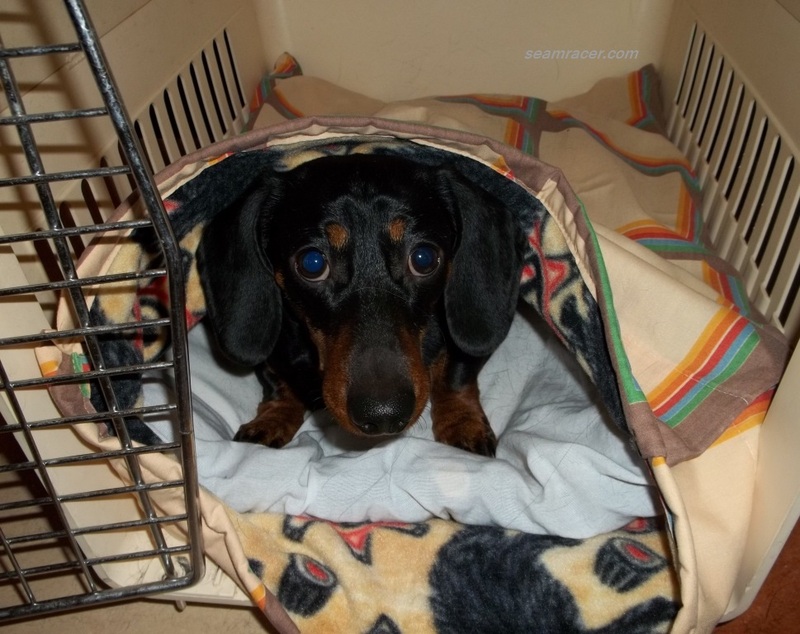 My mom’s side of the family has always had a dachshund in the household – my Grandparents had several, as well as my dad and mom, her sisters (my Aunts), and myself and my family currently own one. These long and short dogs are sweetest companions I know. 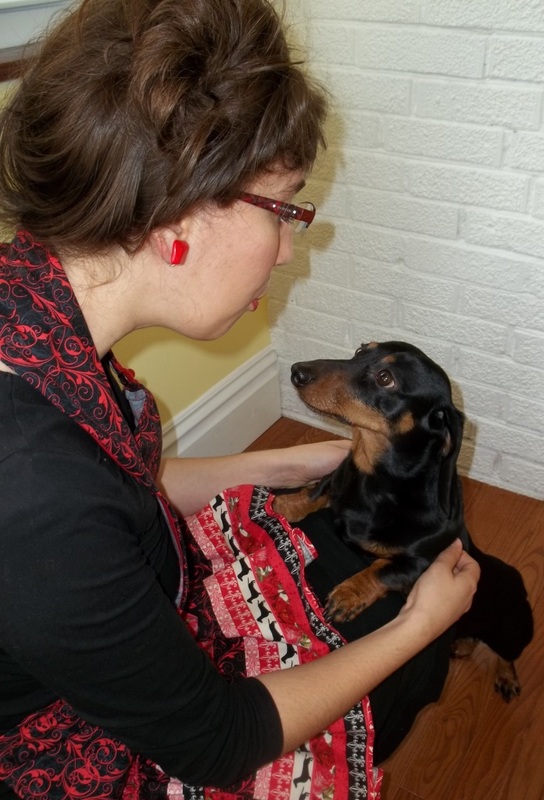 Our own dachsie is good to everyone, but he is especially close to me, his dog-mommy. Anything French is hard to resist for me, after the wonderful time I had in that country years ago. I can never get enough Fleur-de-lis stuff because it is very symbolic to me in many ways, but especially since it is the symbol of our town’s patron, King Saint Louis IX. Aprons are very meaningful and special to me, as well as easy but an incredible amount of enjoyment to create. I try to make each apron different and uniquely individual, especially when it comes to giving them as presents, which is my favorite thing to do with aprons! My aprons are not at all something to ‘save’ in fear of ruining them – they get displayed by being worn on a daily basis and getting loved by enjoying using them. The neatest old vintage aprons are always the ones that are stained and torn or threadbare because I can’t help but think of the times they saw and the work they helped out with – in other words an apron can be a tangible memory! Besides, I seem to think of aprons as the best friend of someone who sews or works with fabric – an aprons protects garments while decorating your style for the day, all the while expressing your personality. What an odd but special combination! FABRIC: Both fabrics are 100% cotton “M’Liss” brand prints, from the “In Paris” line of designs sold at Hancock Fabrics. 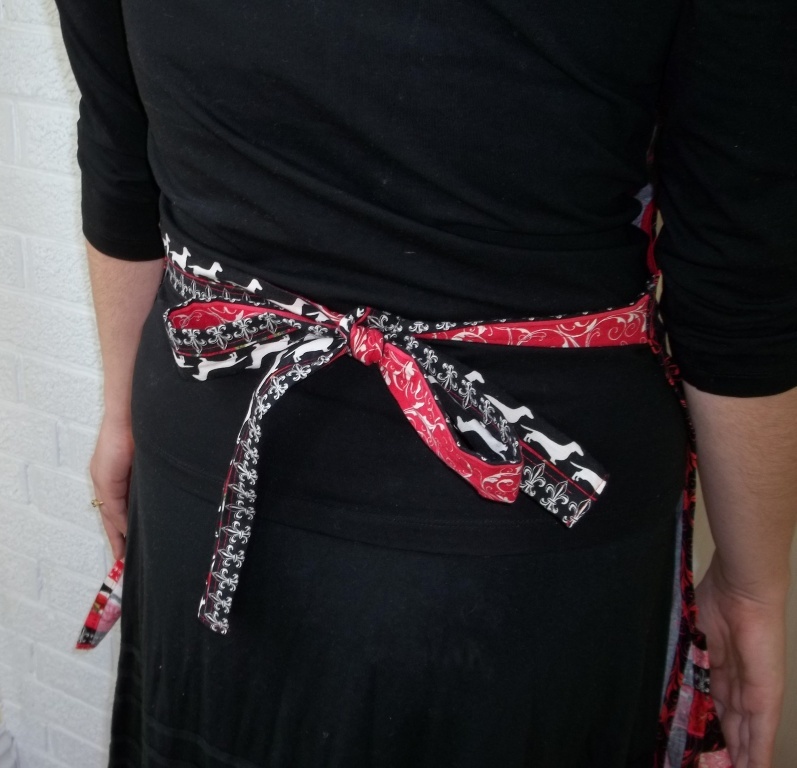 I only had 1 yard of the red and black scroll fabric used to make the basic apron ‘blank’. 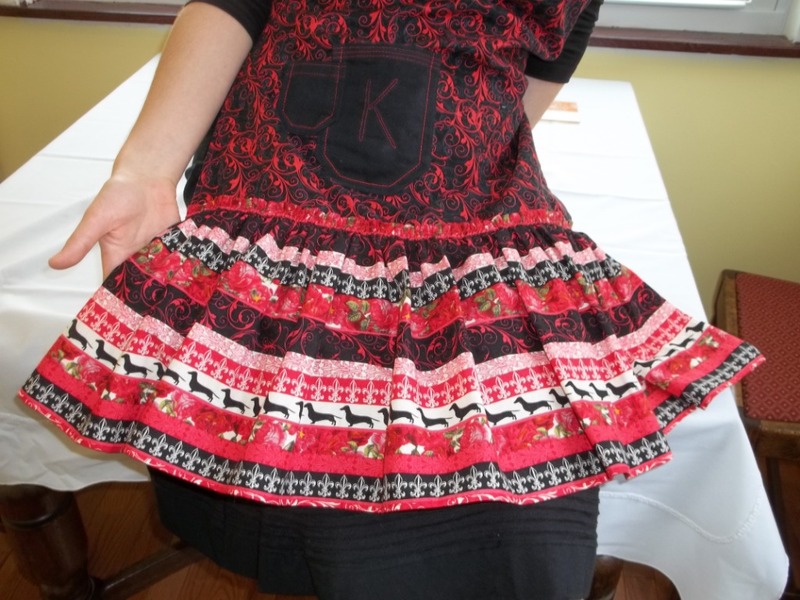 The “layered with lines of designs” fabric was used for the ruffles and ties – and I only had ½ yard of it! Scraps from on hand went towards the apron pockets. NOTIONS: Thread was the only notion needed and that was on hand in plenty. PATTERN: None – I just winged it! TIME TO COMPLETE: Quick and wonderful – each apron took about 2 1/2 hours each, and both were done on December 10, 2014. TOTAL COST: Should I really address price when it comes to a gift? Anyway, with such a small amount of fabric used to make the two aprons and scraps for the pockets, the price was a very reasonable total. Comfy cozy night wear and lounging attire are oftentimes, for one reason or another, neglected from the sewn projects of busy seamstresses like myself. Sewing such items in vintage…especially for men…is a whole other unexplored area in the sewing world. Speaking from my own previous ideas, night and lounging wear are over-looked too often because the final item doesn’t get worn out and about to be seen in public (unless you write a blog post about them!) and thus forgotten amidst so many other tantalizing patterns for dresses, suits, tops, and the like. 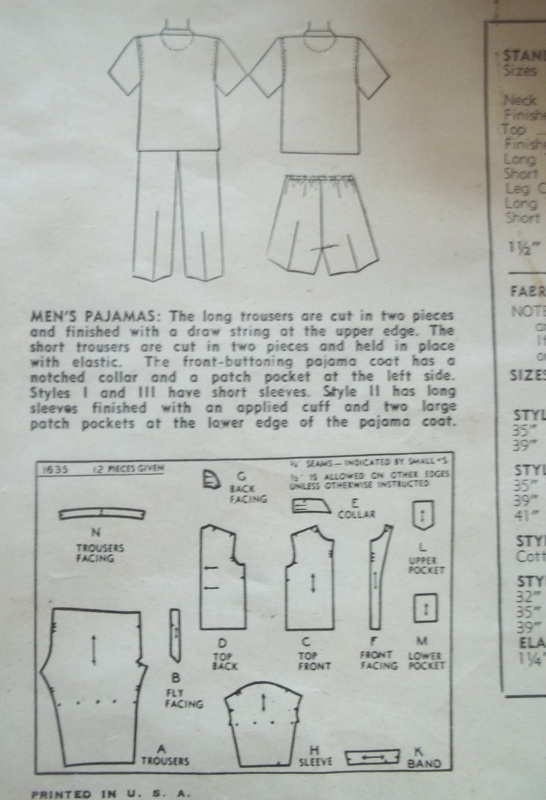 However, I have set myself to fill in this gap by sewing a set of tailored, personalized night wear for my hubby using an old vintage 1940’s pattern from my stash. His pajama set consists of two pants, one matching and one matching/contrasting, and a button-down collared shirt. Now he can get his rest in soft and vintage handmade style! FABRIC: Since the pajama set was for him, I let him pick out what he wanted, and he chose a luxurious “M’Liss” brand 100% cotton from Hancock Fabric store. The fabric design is part of her “Route 66” series, including the plaid. No doubt the fact that we own a little dachshund of our own influenced his pick of fabric…M’Liss always has the cutest dachsie prints. 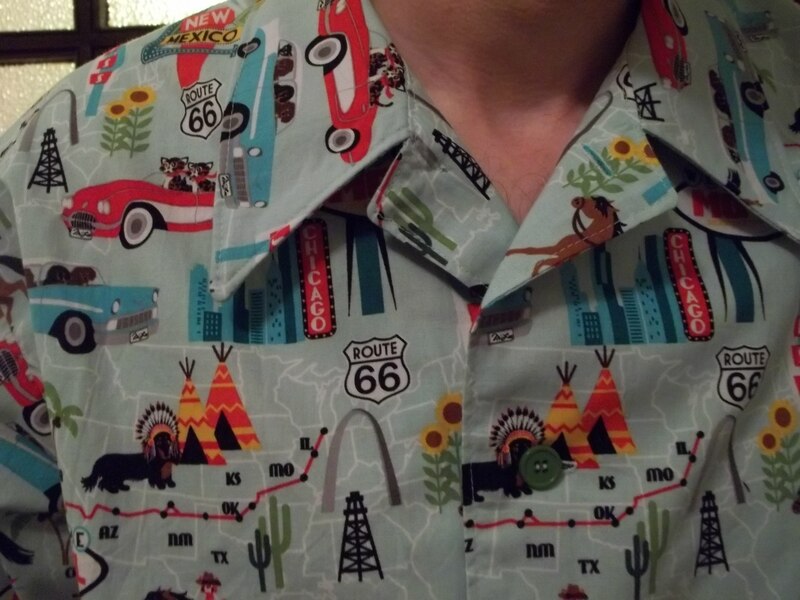 This “Route 66” theme has a definite retro flair which even includes the Gateway Arch from our home town of St. Louis, Missouri! NOTIONS: I had all the supplies I needed on hand, except for one extra length of elastic for the second pair of pants. Being pajamas, it is no wonder they have few requirements and need nothing special to be made. The shirt’s green buttons came from my stash, the interfacing was here already, as well as the thread, bias tapes and elastic. PATTERN: Simplicity #1635, dating (from the research I have done) to the year 1946. It a half and half printed/unprinted pattern, meaning it has the punched out dots to mark seam allowances, dart, and fold lines, but it also has printed numbers and assembly instructions directly on the pattern pieces. TIME TO COMPLETE: Each of the lounging pants took only 3 hours from cutting to finish – great, right!? The shirt, or “front-buttoning pajama coat” as the pattern calls it, took a total of 8 hours. The coat was finished on September 8, 2014; the plaid pair of pants were done on March 8, 2014; and the first pair of pants (not pictured) which match the shirt were made on December 6, 2013, as a St. Nicholas day present for hubby. THE INSIDES: The bottom hems on all pieces are finished off with single fold bias tape, but all other seams are either self-covered or double stitched along the raw edge, for a traditional 1940’s finish. As long as he’s happy with it (and he is), I am! TOTAL COST: Let me think…each pair of pants needs just a tad over 2 yards, and the shirt needed just under 2 yards, thus with one yard of fabric on sale at $4.50, the total cost for his sleeping ensemble comes to a total of about $27.00. 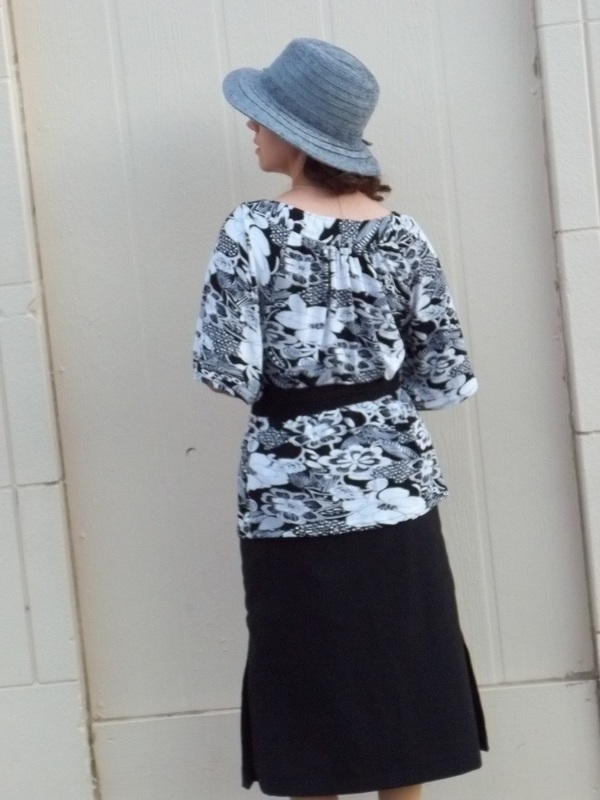 The pattern has simplistic instructions but I am very happy with its wonderful design and fit. It took just a tad bit of fitting time to get his pajama pieces fitting his tall and skinny body type. I have found that (so far) men’s vintage patterns seem to run generous, so I sort of assembled the pattern pieces around him body and figured out ahead of time where to adjust and take in extra space. 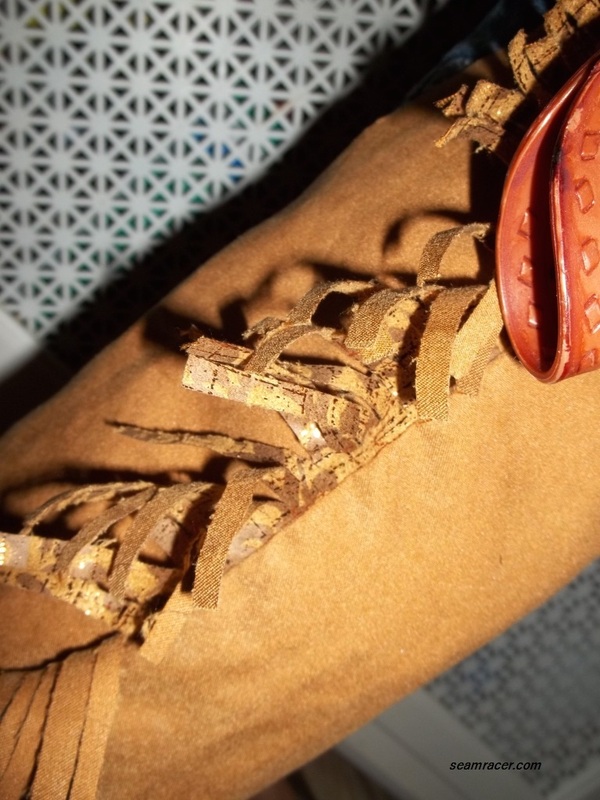 Doing this step of adjusting and fitting the pattern was very enjoyable for me. I feel that the ability to do this step is the big advantage of sewing for others, with the best part being the pleasure of seeing how well your creation looks on someone else. I used the tiny ‘satin’ pins to fold in the fitting darts on the pants pattern. There is no side seam to the pants (as you see in the bottom left corner of the pattern back, at left) and just two pieces to make the pants, so there is one giant pattern piece which needs fitting. This giant pants piece ends up fitting smaller than you’d think. Even still, I took out a vertical dart of about 3 inches, starting at the waist and tapered down to nothing and the pants leg bottom. Next, I had to take a few inches out of the hip horizontally – the pants had a very high waist. Hubby needed a few extra inches on the pants leg bottom, otherwise they would have been high-water. Just be careful with the layout when working with directional prints. For the first pair of pants, I made the mistake of merely folding over my entire length of fabric, and I ended up with one leg’s print going up, and the other going down -so embarrassing but, luckily, taking nothing away from their wearablity. For the shirt, I left the girth and length alone, and so I didn’t need to do any pinning in of darts. The only adjustment here was to slant in the shoulder length 1 inch, thus avoiding what would have been some very droopy sleeves. I did this similar shoulder/sleeve adjustment in this dress project for myself. Two inches were added to the hem length of the sleeves to accommodate hubby’s taste and style. To make the pants, you first sew together the two pants pieces by connecting them at the small, two inch section which is under the front fly opening. Then you sew together the back crouch before you next join the inner leg seam. Voila! This entire step takes me a whole of only 10 or 15 minutes. Now, the rectangular fly facing piece gets sewn onto the right side of the pant’s fly extension, while the left side gets hemmed and turned in as a sort of self-facing. The right side fly facing gets turned wrong sides in, top stitched around, and lapped over the left facing. Both fly facings are tacked down together for 1 1/2 inches from the bottom and 3 inches down from the top waist is you’re doing an elastic finish (which is what my hubby picked out), but the drawstring version calls for an open waistband. 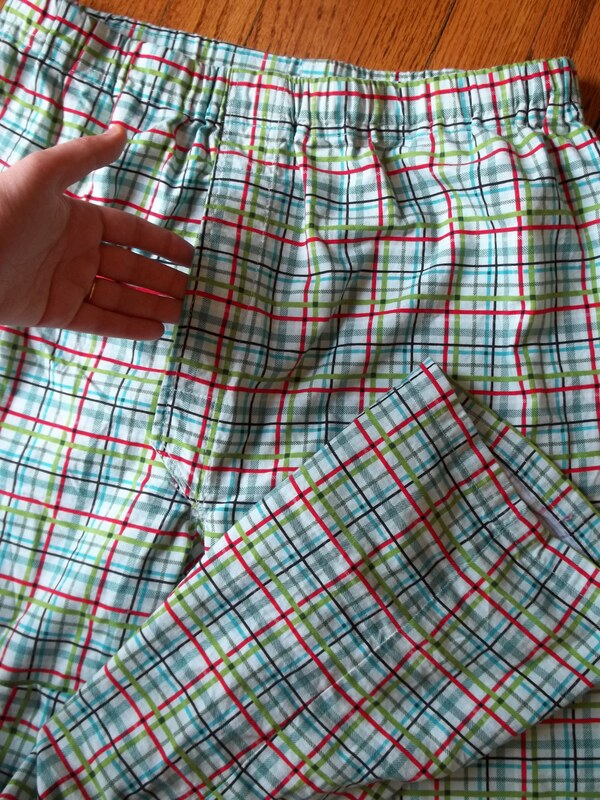 On the first pair of pajama pants which I made for him, I happened to get the proper fly flap closure mixed up, and mistakenly did it opposite sides. The pants still turned out perfectly wearable, but it made me remember my mistake and realize the layout for next time. I guess I’m so used to the ladies’ way of right-over-left, instead of a man’s left-over-right! Between messing up on the fly flap and the direction of the print for pants #1, I made extra sure to get everything just perfect for pants #2. Look carefully and notice how well the plaid is aligned (see picture). Now can understand why I never had the heart to take any pictures of pants #1. There is a slightly difficult corner to deal with inside the pants where the crouch seam and the fly front meet. I found it necessary to clip as extremely close to the stitching as possible, then stabilize the spot with a small strip of bias tape. “A stitch in time saves nine”, so I wanted to do things well now to possibly avoid spending time repairing a ripped crouch seam later. The shirt has a very basic and easy assembly. I doesn’t even have the customary back shoulder panel. However, I did find that the sleeves, and especially the collar and its facings, matched up beautifully. Not all of the collars I have done fit so well – sometimes (like on this blouse) I have to stretch the collar, shirt, and facings for dear life just to get all the layers to match. Besides the balance marks matching, I also matched the print for the collars so the two pet driven cars would be lined up on either side. Another difference with this shirt is the way the sleeves were set into the body. The instructions had showed to sew in the sleeve before doing the side seam. I have seen this before on a few other patterns of mine, but never tried it until now, and it was fun to do something different. Hubby didn’t want, or really didn’t need the pockets (they would just mean more places to check before doing the laundry), so they were left out. I also eliminated the cuff bands for the sleeves in lieu of a regular hem. It was strange to see pajamas with sleeve cuff facing pieces…this is usually reserved for suit jackets or clothing which gets lined. Anyone have any good reasons for sleeve cuffs on pj’s? Last, but not least came time for doing the five buttonholes down the shirt front, and, for once, I was really excited to do this step. Usually for me, making buttonholes is a dreaded event, and they never have turned out that great using a machine which has the A, B, C, D step method. Not anymore! A birthday gift from my parents of a pristine late 1930’s Kenmore sewing machine has changed all of my perceptions about buttonholes. This is because my Kenmore came with a buttonholer machine, an automated attachment that moves the fabric for you – so easy! All you have to figure out is what size cam you need (such as 3/8, 5/8, or 1 inch) to match your buttons, and drop the right cam in the bottom of the buttonholer. The feed dogs get covered by a face plate so the buttonholer can clamp the fabric, and, once the foot and needle are taken off, the attachment itself affixes to the machine presser bar. Then the magic begins. In 60 seconds or less I was able to have perfect, uniformly sized buttonholes in exactly where I wanted them to be made. 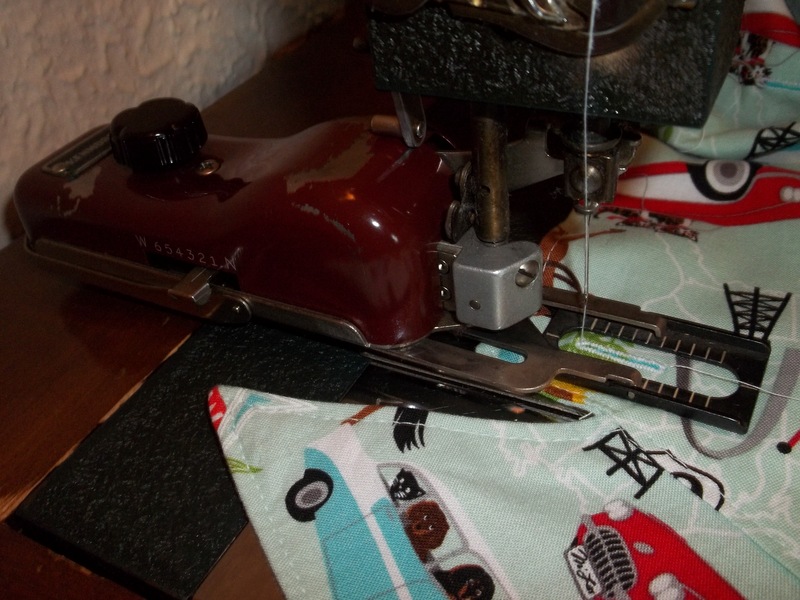 Unless you have used a buttonholer, you might think I am a bit over-talking this attachment, but it really is “the 7th wonder” of the sewing world for those using older non-electronic sewing machines. All sorts of opportunities for patterns with button features now can easily be made by me with no stress, little work time, and loads of fun! Needless to say, I was a bit disappointed that hubby’s pajama shirt only need five button holes for his five bright green buttons. Oh well! I am chomping at the bit to dive right into some more great blouses, dresses and more needing plenty of buttonholes. Look for these projects soon. Hubby’s pajama set is yet another 1946 project. This makes a total of 4 makes from patterns of the year 1946. 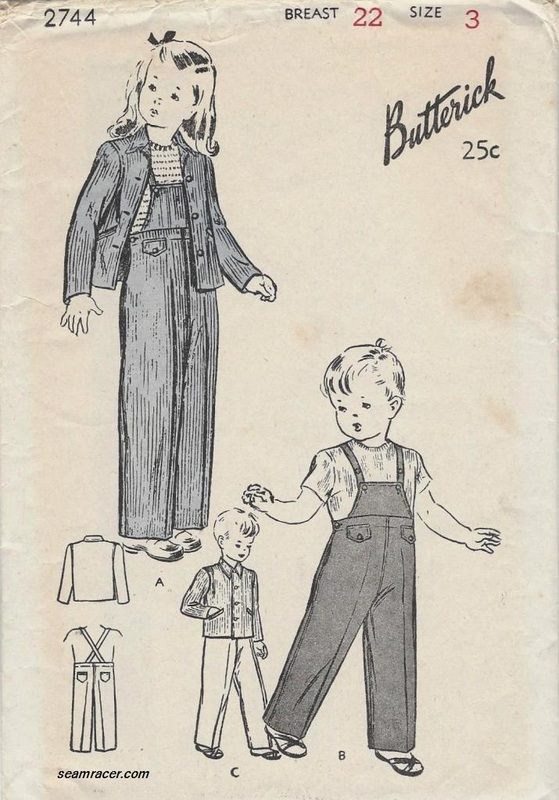 I suspect that there was a post-WWII boom of both sewing pattern releases and new design ideas. 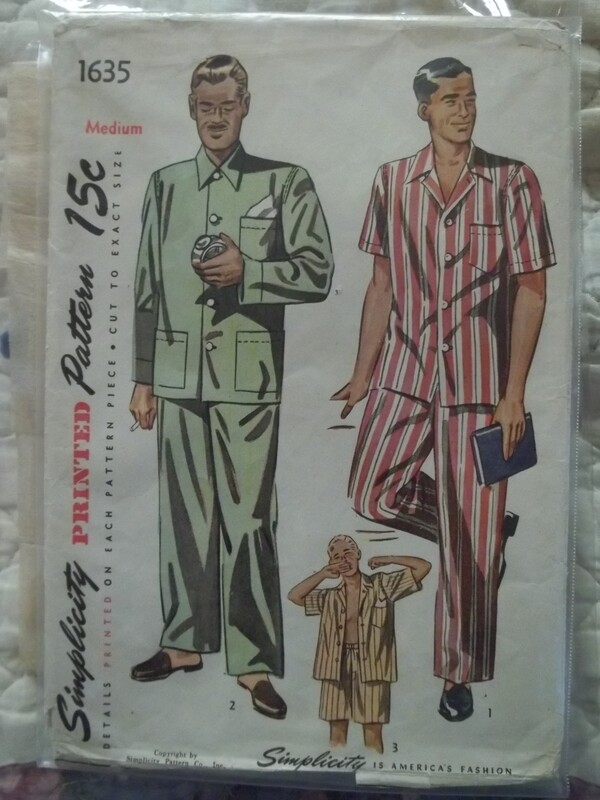 However, this men’s nightwear pattern is not that unusual, even if it wasn’t from the year 1946. 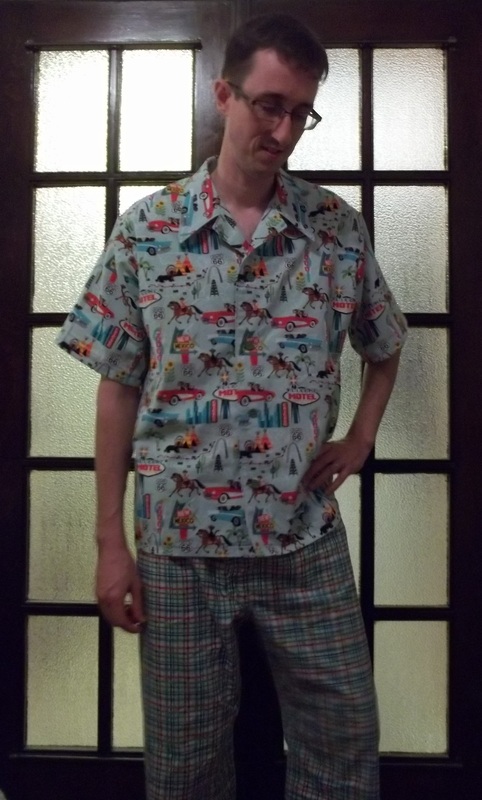 Vintage/retro men’s nightwear patterns are out there to find if you look for them without spending too much effort. You don’t even have to spend too much in money, either, because there doesn’t seem to be much of a demand or market for men’s vintage/retro patterns. Therefore the prices stay (so far, knock on wood) reasonable, unless I happen to start a new trend here! Even though it is a bit too late (holiday speaking) to be posting something from Thanksgiving, it’s never a bad thing to give thanks. Appreciating one’s blessings is good for any time and season! Personal illness and time constraints have delayed my revealing of these in-house projects. So now I am finally getting around to posting two items that help our home become more ready for the fall/winter season : a dachshund themed Thanksgiving tablecloth for our dining room, and a fleece lined snuggle sack for our own live hot doggie. 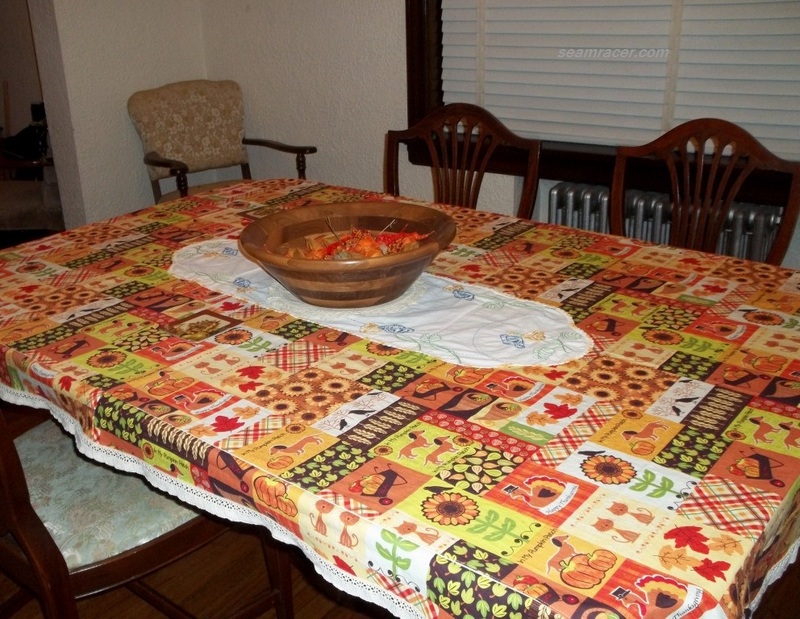 FABRIC: For the Tablecloth- a 100% cotton, M’Liss designed “My Pumpkin Patch II” fabric. Even tough it looks like a patchwork quilt, the fabric is actually just printed seamless fabric. It is trimmed with a 100% cotton ecru colored lace. For our Dachsie’s Snuggle Sack- a thrift store pillow case for the outside, and a little over a yard of fleece for the inside. TIME TO COMPLETE: It only took me about 1 hour to make our dachsie’s pillow cover and our tablecloth was finished in about one afternoon. Both projects were completed in November 2012. For the dog’s project, I simply measured the width and length of the pillowcase and sewed the fleece together at 1/4 smaller sizing than my measurements. Then, the fleece pocket was slipped inside (seams facing the pillowcase) and the edges of the open end were turned inside to cover the raw fleece edge. I took the time to do some hand stitching along the pockets inner corners and tack the two layers together. 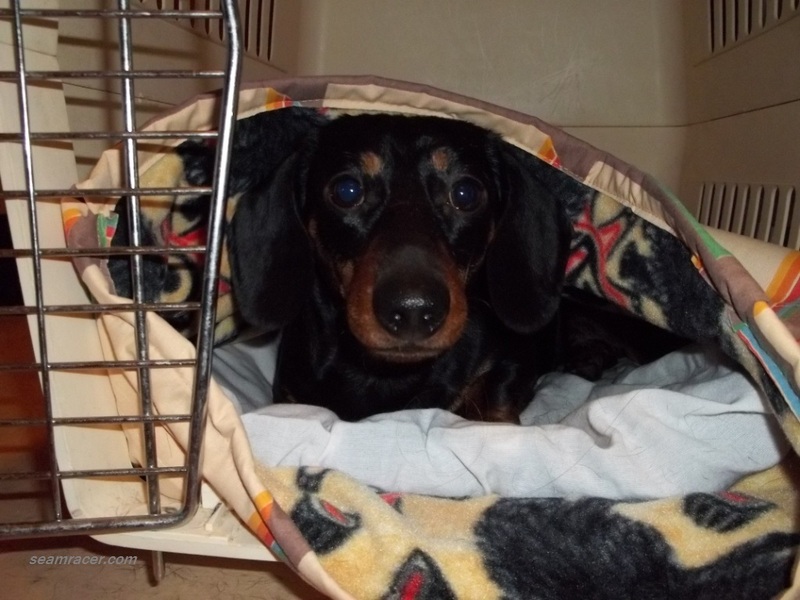 I just wanted to make sure any of our dachshund’s “tunnel-digging”, done in his bed, doesn’t turn his pocket inside out. This is such an easy project and the very best thing imaginable for any pet that likes to stay warm and snuggly. The warmth inside sure does build up when he crawls out in the mornings! Blankets just don’t do the job as well as this fleece pocket does at making a bed that our pet is more than happy to retreat into. As for our tablecloth, this took a bit more mathematical figuring. The cotton was a 45 inch print and our table fits table covers 80 by 60 inches. Thus, I took the extra length which I added on when I got my fabric cut, and put it towards making 6 strips to even out the rectangle shape. Two of my 6 stripes were added onto the two short ends, while the remaining 4 strips were joined together, two as one, making long strips for both longer sides of the table. I ended up with a “border” look that was sewn to the solid cut just along the edge of the table…so perfect! I wish I could show you my piece of paper with all my mathematical equations (I was so proud of myself!) to come to this finished product, but I’ve lost it, unfortunately. I am also very proud of how well I sewed sharp corners into the lace edging (see picture at right). I also precisely figured out how much lace to buy doing my loose ‘eyeball’ type of measurement in the fabric store (the kind of figuring where I just hold up the lace and measure with my arms). I actually had only 7 inches to spare at the end of it all! That 7 inches of lace went towards this lovely 1920’s project. 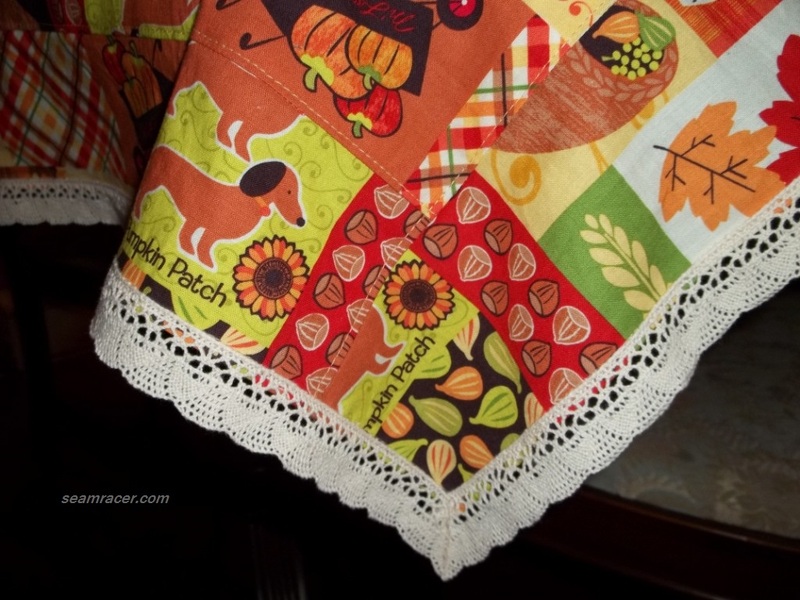 There are 4 small squares of scrap fabric leftover from making the tablecloth. I have started to make these 4 scraps into coasters using ruffled cotton, lace, batting, and possibly plastic vinyl to prevent stains. I don’t have an exact idea in mind right now so the coasters might actually be made for our next Thanksgiving. So is life. Both projects make me smile – inside and out. The table cover is so bright and cheery, with the dachshund theme being such a personal favorite of our whole family. Little furry guy’s snuggle sack makes me so happy, because to see someone (or something) else enjoy what I have made is a real treat! Now I’ll have to make more things for the humans in our household (hubby and kiddo)! Just look at his cute “the nose” picture at left…see how happy his ears are, also. Enjoy all your holidays, everyone!